In the past some residents drained their pools into the culverts which feeds directly into our ponds. Please DO NOT DO THIS!!! De-chlorinate the water in the pool prior to draining. This can be done through mechanical or chemical means. These types of products are readily available at local stores. 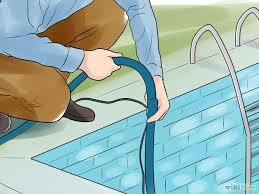 1) Allow pool water to sit at least 2 days while receiving a reasonable amount of sunlight, and without further addition of chlorine or bromine. It is recommended that the chlorine level be tested after 2 days to ensure that safe levels are met (below 0.1 mg/l). 2) Ideally, pool water should be removed and trucked out. Otherwise, pool discharge should be directed across your lawn, not down your driveway or into nearby storm culverts. Our storm sewer system leads directly to wetlands, ponds, and the river. These recommendations are based on guidance from the Illinois Environmental Protection Agency. Visit www.epa.state.il.us/water for additional information. Please do your part to help promote cleaner wetlands, streams, lakes and rivers.